airFiber® implements the most efficient use of unlicensed-band spectrum – a vital attribute in increasingly crowded RF environments. 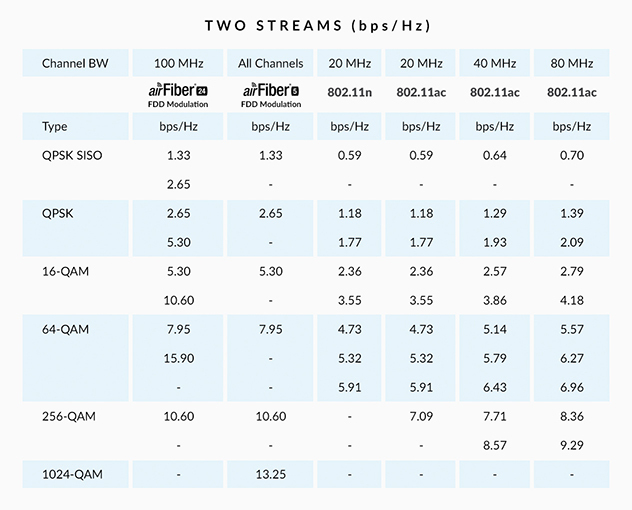 By employing a unique dual-antenna design and proprietary self-interference cancellation algorithms, airFiber extracts more usable channels out of the available spectrum than any other comparable radio system. airFiber’s built-in configuration tool guides the selection of RF channel bandwidths, transmit power, and other parameters to minimize interference potential and optimize link budgets.